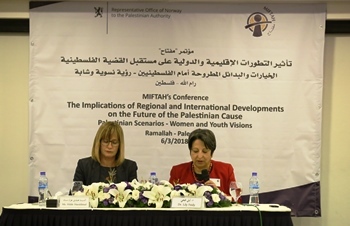 On March, 6, MIFTAH organized its 2018 conference in Ramallah and Gaza – via videoconference – entitled: “Implications of Regional and International Developments on the Future of the Palestinian Cause Palestinian Scenarios- Women and Youth Visions”. The conference was held within the context of the developments in the Palestinian arena following the changes in international and Arab positions, the American monopoly over the peace process, the impasse in the reconciliation process and the hindered means to strengthen the internal front due to the continued political division and the defunct PLC. Various societal sectors attended the conference, women and youth foremost. Representatives from the various political factions and PLO institutions also attended, in order to discuss and propose alternatives for confronting the crises and existential challenges today. 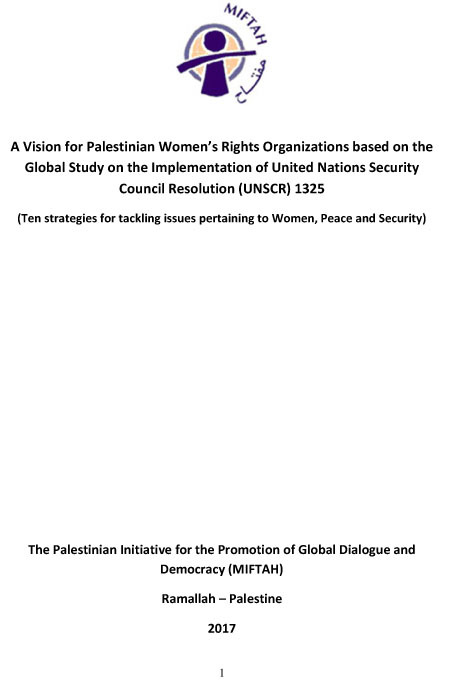 These challenges call for creating the initiative of a national gathering where women and youth have a central role in producing conclusions and recommendations that determine future directions for the Palestinian cause. The conference topics were discussed in three sessions: The first broached the nature of regional and international changes and their impacts on the Palestinian situation and available options. It also discussed visions for the proposed political options. The other two sessions addressed the visions of women and youth in confronting political challenges and the deadlock in efforts to achieve national reconciliation and end the division. The participants concluded that confronting internal challenges and regional and international developments, especially the positions of the current US administration, require thinking outside of the perimeters of current Palestinian political action. This could be achieved by launching a national effort in which the various Palestinian sectors contribute, wherever they are located, with women and youth movements at the forefront. It also includes building alliances with international congregations, international civil society organizations and members of parliament that support the Palestinian cause, with the goal of supporting the Palestinian right to establish an independent state, the right to self-determination and the demand to implement all international resolutions pertaining to Palestinian rights. The options and alternatives proposed by Palestinian women and youth leaders reflected their pioneer and historic role in active participation in the national liberation struggle and in preserving the unity of the Palestinian people and their right to resist the occupation. The conference confirmed the need to develop a unified strategy for the struggle with the participation of all political and societal forces in confronting the current challenges and in adopting all national options. This means not confining these options between the two approaches of negotiations and armed resistance but through adopting new forms of struggle that can rise to challenges of this period. It also reaffirmed the validity of boycotting as a national option and a means of resistance at all official and popular levels. The conference called for the revival and reform of the PLO as a safety net for the Palestinians, through the resumption of meetings of the PNC’s preparatory committee and follow-up of what was agreed on in its meeting in Beirut, Lebanon in January 2017. It also called for setting a time limit of no longer than the end of 2018 to hold presidential, legislative and PNC elections, for strengthening political pluralism and building a democratic political system that embraces the rule of law and separation of authorities and which includes public liberties; it stressed on the principles of integrity and transparency in the management of public affairs, reaffirmed the need to restore youth bodies and their roles, namely the General Union of Palestine Students [GUPS] and reconsider the structure and tasks of the Higher Council for Sports and Youth. Lastly, it called on youth federations to hold their conferences with the inclusion of women and youth representation in their administrative boards. The participants also stressed on the need to initiate a comprehensive national dialogue to discuss the Palestinian Central Council decisions and to set mechanisms for implementing them. They focused on the need to regain national unity as a priority and a key component for continuing the battle to end the occupation, to lift the siege off the Gaza Strip, remove the obstacles to reconciliation efforts and address the issues pertaining to the everyday and humanitarian needs of our people in Gaza. This, they said, requires all parties to sit at the table to discuss and address these issues with a sense of national responsibility. The women’s movement confirmed the need to form committees with the task of monitoring the reconciliation committees and declare clear positions on the understandings that result from the reconciliation meetings. They also proposed that a blacklist is drawn of up parties obstructing the reconciliation. 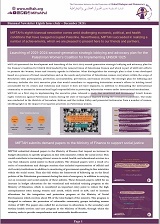 Finally, the participants confirmed the need to take the necessary measures to connect with Palestinian public opinion in the homeland and the diaspora, strengthen the relationship with Palestinian communities and guarantee that they play an effective role in networking and interacting with the communities in which they live, in order to contribute to pressuring their governments to support the Palestinian position and disseminate the Palestinian narrative.